These small railway wagons represent the vehicles which transported large volumes of copper ore from inside the mountain you can see as you look eastwards from here. Some of the old workings at Sygun copper mine are now open to visitors. 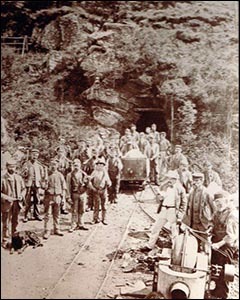 The photo (courtesy of Sygun Copper Mine) shows Sygun miners posing beside one of the mine's wagons. Copper was mined at various places in Snowdonia, possibly from prehistoric and Roman times. Sygun mine (also known as Sygyn) was opened in the 18th century. In the 19th century, copper from North Wales was traded in Swansea, then home to the world’s largest copper smelting industry. On a typical day, 8 July 1829, 13 tonnes of Sygun copper ore were sold in Swansea for the low price of £1 7 shillings (c.£70 in today’s money), while another buyer paid £3 11s 6d (old pence) for 12 tonnes of Sygun ore (c.£180 today). As demand for copper increased, Britain began to import increasing volumes of ore at prices which made small mines like Sygun uncompetitive. A flotation process developed at Sygun in 1898 enabled more copper to be separated from the waste rock, but the benefits were short-lived and the mine closed in 1903. In the same year Beddgelert resident Daniel Roberts applied for compensation from the British Ore Concentration Company because his son Henry had been killed in an accident at Sygun mine. Henry had earned c.24s a week there. In January 1903 the local fishery board noted that a “settling pit” had been dug near the mine where polluted water from the workings deposited impurities before flowing into the river Glaslyn. Although fish had again become plentiful in the lower part of the river, the board was concerned about serious pollution from the Snowdon copper mine, further upstream. By 1910 Sygun’s mine machinery had all been removed. The workings lay derelict until the 1980s, when some of the tunnels were cleared and adapted for visitors to walk through. Sygun copper mine now operates as a tourist attraction. Follow the link below if you would like to visit.